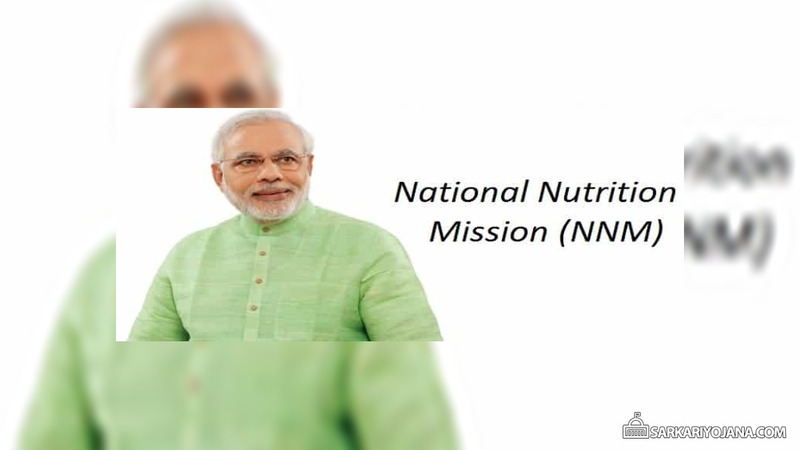 Central government has launched National Nutrition Mission. Subsequently, NNM will tackle the problems of under-nutrition, anaemia, low birth weight and stunting. Accordingly, children (between 6 months to 3 years), pregnant women and lactating mothers (till six months after birth) can take ration at their home. NNM Scheme is going to benefit around 10 crore people across country. PM Narendra Modi has launched Rashtriya Poshan Mission / Kuposhan Mukt Bharat Scheme in Rajasthan on 8 March 2018. Aadhaar Card is a mandatory document to avail benefits of this Suposhan scheme. For NNM, the central govt. has allotted a 3 year budget of Rs 9046.17 crore per year (2017-20) for its successful implementation. Central govt. 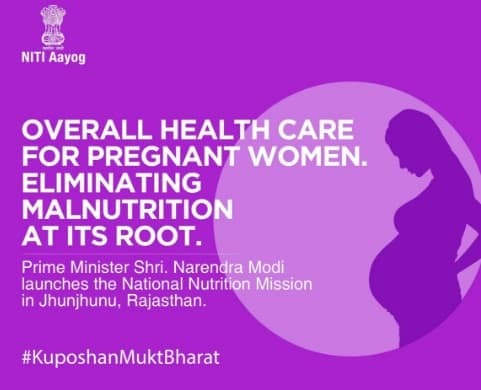 has launched this Kuposhan Mukt Bharat mission to provide necessary and adequate nutrition to women, adolescent girls and young babies (0-6 years of age). Moreover, NNM mission will map all other related schemes which contributes to address malnutrition. Govt. will create a strong convergence mechanism to tackle under-nutrition, low birth weight, anaemia and stunting. Accordingly, govt. will perform social audits to ensure that this scheme is properly implemented. In addition to this, govt. will also give Rs. 500 to all the Anganwadi workers (AWWs) to ensure enrollment through Aadhar. Moreover, govt. will set up an ICT based real time monitoring system. This will reduce the work load of AWWs and put an end to existing process of maintaining registers. To encourage workers on use of latest technologies through IT based tools like Smartphones. Furthermore, Central govt. will also open various Nutrition Resource Centers (NRCs). For this purpose, govt. will also focus on involvement of masses through Jan Andolan. NNM’s primary focus is to reduce rate of under-nutrition and low birth weight by 2% per year. 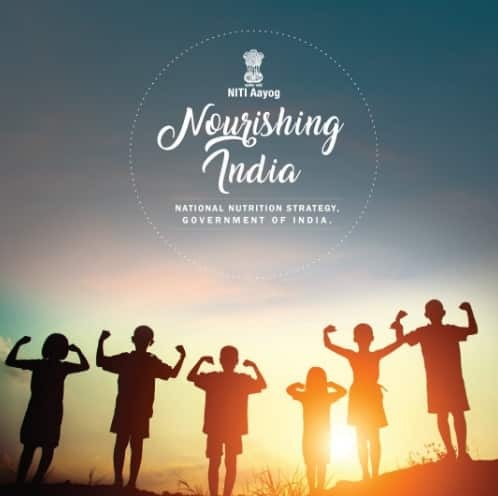 National Nutrition Mission is going to witness a substantial reduction in stunting from 38.4 percent (National Family Health Survey 4 Report) to 25 percent till FY 2022. 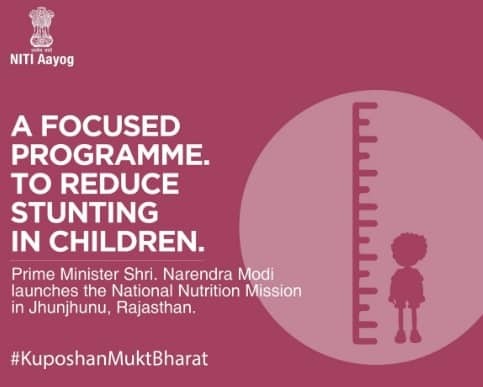 Subsequently, Rashtriya Poshan Mission will reduce the anaemia rate among young children, women and adolescent girls by at-least 3% every year. — National Nutrition Health Mission targets to benefit around 10 crore people. Accordingly, Central govt. will also provide incentives to State and Union Territories (UTs) to meet targets. — Henceforth, govt. has allocated budgetary provision of Rs. 9046 crore every year from 2017-2020 for Kuposhan Mukt Bharat Mission. — Rashtriya Poshan Mission scheme will include various states in Phases. As per the proposal, govt. will cover 315 districts in the year 2017-18, 235 districts in 2018-19 and remaining districts will get covered in 2019-20. — Government Budgetary Support will provide 50% of funds and the remaining 50% funds are organized from IBRD or any other MDB. — Accordingly, Govt. budgetary support will remain in the ratio 60:40 between Centre and States/UTs, 90:10 for North Eastern Region (NER) and Himalayan States while this is 100% for UTs without legislature. — Central govt. share for NNM over a period of 3 years would be Rs. 2849.54 crore. Central govt. is going to monitor and also perform convergence action plan upto grass root level. For this reason, NNM will focus on the use of IT technology for monitoring purpose. Furthermore, NNM mission will also track distribution of supplementary nutrition through Anganwadi Workers, Asha Workers and Auxiliary Nurse Midwife level under Integrated Child Development Scheme (ICDS). « Special Pension Scheme for 3 Lakh Pensioners Approved By West Bengal Govt. My name is anamika I m 9 months pregnant. Mujhe koi facilities nai mili. Na koi diet na koi paisa. Aanganbaadi jao to khte hai ki govt ki trf se koi rashan nai as RHA. Sab sarkaari chor khaane KO baithe hai.an aap mujhe mere 9 machine ka hisaab doge?